WILMINGTON – With four bracket champions, the Wilmington High School tennis team won the Hurricane Invitational Saturday on the WHS courts. Brayden Rhoads and Jack Romer in singles action and both doubles teams claimed championships for Steve Reed’s squad. First doubles titlists were Jonathan Fender and Caleb Reed. The second doubles champs were Brady Henry and Jacob Romer. WHS had 41 points while runnerup Lebanon had 29. Blanchester was eighth with 10 points. Jacob Miller was fifth at first singles, the top placement for the Wildcats. En route to the title, Wilmington had several big-time victories. Brayden Rhoads at second singles defeated Doughman of Lebanon in the championship match 7-5, 4-6, 10-3. 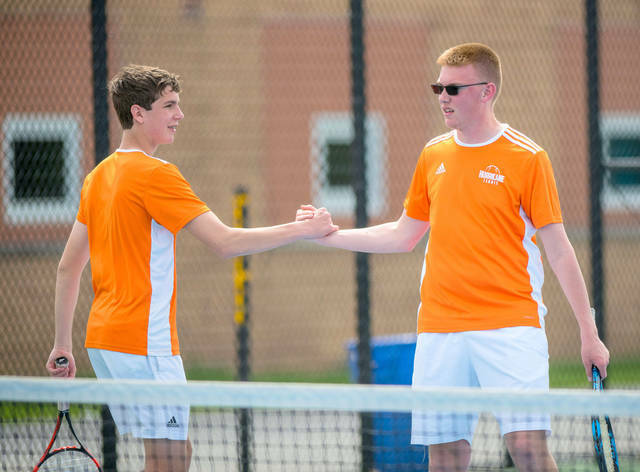 Fender and Reed won two straight three-setters at first doubles – 3-6, 6-0, 10-4 over a pair from Greenville in the semifinal round then 4-6, 6-0, 10-4 over a West Clermont duo in the title match. Henry and Jacob Romer won their semifinal match against Greenville 6-1, 4-6, 10-6. Romer at third singles had three relatively easy victories. Wilmington 41 Lebanon 29 Little Miami 28 West Clermont 23 Elder 20 Greenville 20 Springfield 14 Blanchester 10. • 1st-Avery Bradshaw (W) def B. Leigeber (GR) 8-3; was def by A. Rich (LEB) 6-0 6-3; was def by E. Cundiff (SP) 3-6, 2-6. Finished fourth. • 1st-Jacob Miller (B) was def by E. Cundiff (SP) 3-8; def B. Leigeber (GR) 8-5; def M. Meade (EL) 8-4. Finished fifth. • 2nd-Brian Miller (B) was def by B. Rhoads (W) 2-8; was def by J. Janszen (EL) 0-9; def P. Patel (SP) 8-1. Finished seventh. • 2nd-Brayden Rhoads (W) def B. Miller (B) 8-2; def E. Huang (WC) 6-1, 6-0; def E. Doughman (LEB) 7-5, 4-6, 10-3. Finished first. • 3rd-Jack Romer (W) def R. Hiller-Freund (SP) 8-0; def A. Vinel (EL) 6-1, 6-1; def L. Williams (LM) 6-3, 6-3. Finished first. • 3rd-Colton Wilson (B) was def by A. Vinel (EL) 8-9 (4-7); was def by A. Abell (GR) 8-9 (4-7); def R. Hiller-Freund (SP) 8-0. Finished seventh. • 1st-Jonathan Fender, Caleb Reed def Heeg, McCollister (B) 8-2; def Galloway, Muhlankamp (GR) 3-6, 6-0, 10-4; def Keith, Payer (WC) 4-6, 6-0, 10-4. Finished first. • 1st-Ian Heeg, Cody McCollister (B) were def by Fender, Reed (W) 2-8; were def by Gates, Saupe (EL) 3-8; were def by Grooms, Mistry (SP) 2-8. Finished eighth. • 2nd-Brady Henry, Jacob Romer (W) def Patel, Yalaz (SP) 8-2; def Badell, Price (GR) 6-1, 4-6, 10-6; def Deshmukh, Judd (WC) 6-1, 6-1. Finished first. • 2nd-Bryce Bandow, Logan Heitzman (B) were def by Deshmukh, Judd (WC) 3-8; were def by Patel, Yalaz (SP) 2-8; were def by Sutton, Watson (LEB) 3-8. Finished eighth.